Alex had a successful, incredible, awesome and fulfilling weekend. By osmosis I did too. After dropping Alex off, I knew she was safe. I also knew she was with people similar to her. She would make friends, feel confident and shine. I left her without any fear, only a slight sadness my baby was growing up, but ready to enjoy my time away from her. Alex called me five times over the weekend. This is not unusual; Alex loves her cell phone, and I love that she has to speak clearly to be understood on the cell phone. Her calls this past weekend were different from her usual calls; she was giggling. My sweet, non-nervous daughter called to tell me about her meals (very important for Alex), her roommates, her coaches and her training schedule. She did not complain about her ankle once. I could have predicted that! We were told to be at the Olympic Facility at 1:00 on Sunday for a family meeting. At first I could not see Alex when we walked in, but she found us. She was sitting in the front of the room, in her new blue Team Colorado jacket, chatting away with friends. My heart melted at the sight of my beautiful daughter surrounded by friends. In our local high school, Alex is surrounded by what I call acquaintances. These girls are very nice to Alex and as inclusive as they can be, but they are not friends. I do not believe they look at Alex as an equal, and certainly do not include her in their parties. What I want for Alex are friends with whom she can confide, kids who are on the same level, and kids she feels comfortable with. This is what I saw yesterday when we picked up Alex; isn’t this want we want for all our children; friendship and confidence? During the hour long meeting we were given information about the National Games. The 28 athletes, seven coaches and five staff members will be traveling by bus to Lincoln. As of now, the Colorado contingent is not participating tin the Cessna airlift. I suspect this is an easier mode of transportation for some of the athletes, and I am more comfortable with the bus. Team Colorado will leave the Denver area at 9 AM on Saturday, July 17th for the nine hour ride. Parents and families were asked NOT to follow the bus. We were also told we would only be able to see our athletes twice during the games; they will be in their own quarters with tight security. Any visits must be arranged through the coaches. The kids will not be able to call us, except in the evening, and cell phones were discouraged. We will see the athletes at their events, but that’s about it. We were reminded that our kids are now Team Colorado, athletes representing their state and must act accordingly. This is so cool! The SOCO (Special Olympics Colorado) staff shared the weekend had been very successful. The athletes and the coaches bonded, and I could feel the excitement and passion in the room. Each athlete was introduced, stood up and was applauded. They were pumped and proud. As was I.
I have shared this before, the Special Olympics is the most incredible organization I have come across in my life. It is filled with selfless and noble people whose mission is to help others succeed. It has made a huge difference in our lives and the lives of disabled people across the world. 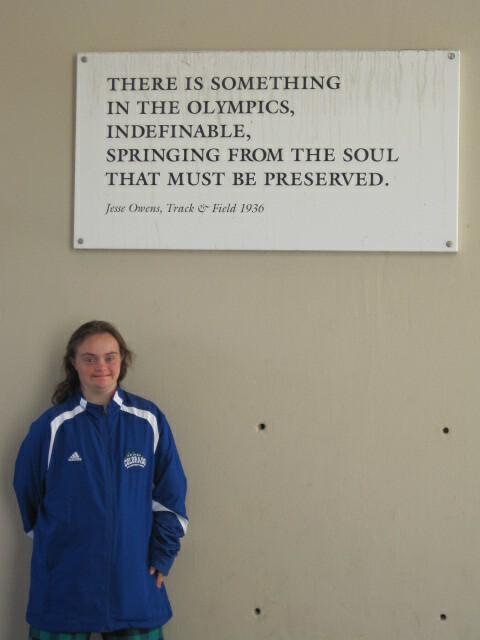 I am proud to be a Special olympics Family. We met with Alex's coach and her three team mates after the family meeting. 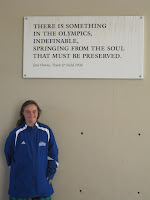 Alex will be competing in the 100 and 200 meter races, shot put and will run with her team in a 4x100 relay. As always the nervous mom, I asked about Alex’s participation over the weekend. Coach Larry assured me she did well, and did not have trouble with her ankle. I must admit this did not surprise me in the least, especially after I learned "Jeremy" taped her ankle and showed her some exercises for her ankle. Coach stressed to Alex the importance of healthy eating; no meals after 7 PM, no sodas and lots of water. He talked to Alex about stretching and keeping in shape. I truly believed Alex listened, unlike her ability to hear my constant reminders. I think (and hope) that now Alex has a tangible understanding of Team Colorado and the Games; she will modify her behavior (i.e. eating). 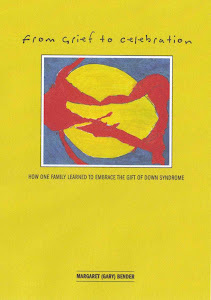 People with down syndrome are visual learners, and this was the ultimate in a visual learning experience. She does not want to let her team down, and she hates to lose. One might say the apple does not fall too far from the tree. 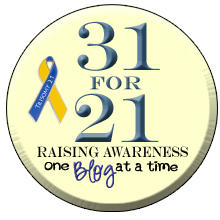 Thanks for reading...I am having so much fun sharing...stay in touch!